To celebrate the launch of TheHerbExchange.com and springtime gardening, we are giving away an instant culinary herb garden. 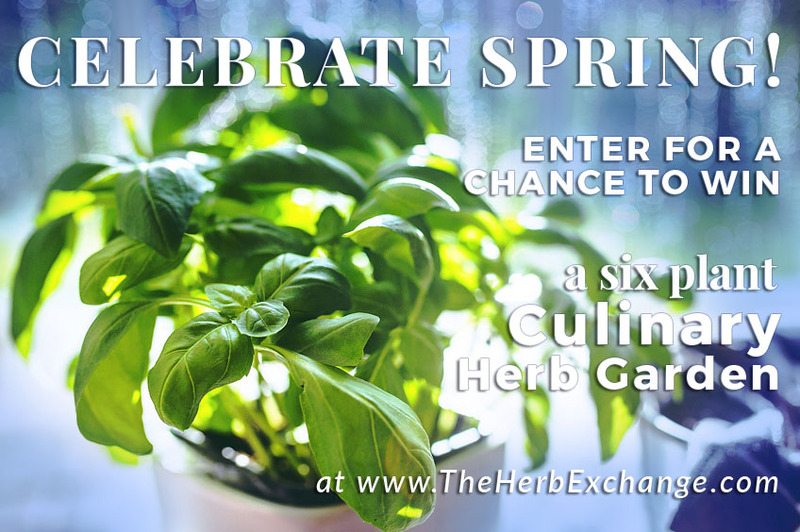 Enter below for a chance to win one each of the following 6 plants: Genovese Basil, Italian Parsley, Italian Oregano, French Thyme, Mojito Mint, & Garlic Chives. Thanks for the chance.. I just placed my order today for this year’s herbs, but most of these were not on my list..
A whole new community, including residents, staff and chefs of its four restaurants, will be introduced to the culture and tastiness of herbs when my husband move to a senior citizen residential center in Dallas the end of March. A longtime member of the local chapter of the National Herb Society, I have been promised the grounds and any necessary assistance to plant and maintain an herb garden for the use and enjoyment of residents and staff. Thank you once again to possibly put a new garden project into development. Seeeing a live garden come to fruition delights me and helps both of my children learn a love of gardeningbof their own. I always had a herb garden. I would really love having this. Thank you for the chance. Thanks for the chance to win. I am disabled and I love to garden. Hoping for good weather this year so I can have a small garden. I’m disabled too and know exactly what you mean. I need a super raised bed if I wanted to do major gardening and that is cost prohibitive for me. I’ve wanted to do aquaponics too, but again…limited funds. It’s really too bad because I really miss fresh grown, flavorful veggies that I know aren’t tainted and it saves a lot of money in the long run too. I’m miss canning too.lol I’m into medicinal herbs, “weeds”, bark, and roots as well. Gardening has been one of my most favored activities, but since my stroke disabled me fr I om working in my garden, I have been limited to working with container gardening. Not as satisfying, or effective, but better than nothing. I plan on putting a large wooden “container” on my sunny porch this year to see how it would do. Always look forward to spring because of your great products! Thank you for what you do.. I have purchased plants from you before and they were perfect. I have never received plants that were as healthy and in fantastic condition. First time visitor, long thyme grower! Ready to plan and plant.Loveage and Papalo are alive and well for just some of my new finds here. Happy Spring. Thank you for doing this. If I had the room I would definitely try something like this. Thanks for this opportunity! I love herbs! Keep Life Simple Garden, How true. There is something so peaceful about gardening , it just makes you feel healthy and alive. I love to garden 😀 Yay Spring! Wonderful to walk out the door and enjoy the growing awesomeness of herbs! I’m ready for spring and planting herbs. Thanks for the giveaway. Have grown herbs in past and looking forward to a new start. So happy that spring is almost here! What a wonderful site you have, I am getting excited to see Earth renew herself again! Thanks for the wonderful herbs you grow. Please keep them coming. Please enter me in a chance to win your herb garden , as I love herbs and would like to start a herb garden ! not only for me but for the bees and butterflies . I love all of these herbs, so I would love to win! Wish me luck on my recent purchase. I can’t seem to keep any plants alive- I’m surprised my kids are still. Maybe I’ll fare better than with seeds; thank goodness I’ve found you! I can’t wait to get started planting my herb garden this year. I really enjoy growing my own herbs, because they are so expensive to buy at the store now days.